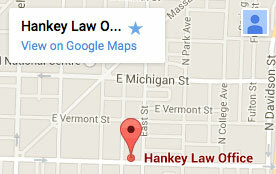 Attorney and Indianapolis native Sondra L. Burger has practiced with Charles D. Hankey since 1990. She handles cases in the areas of Social Security Disability, Worker’s Compensation, and Personal Injury. She earned her law degree at Indiana University School of Law-Indianapolis. She is a member of the Indianapolis Bar Association and the National Organization of Social Security Claimants Representatives (NOSSCR).